On Friday you can access any grandstand with any ticket, subject to space, Grandstand N, E and B are not applicable (tbc). Unlimited access with all tickets to General Admission areas. During the Grand Prix weekend you can walk all around the public areas on the inside of the track, via the asphalt paths that connect the areas. The only single day tickets will be for the E, N and B Grandstands. At Catalunya you will not miss any detail of the race! Overtaking, pit stops, skids! You will see them from any point of the Circuit, as there will be screens view-able from all the strategic spots. A campsite in the Circuit's North Area is available during the Grand Prix. It opens on Wednesday of the Grand Prix week until the Sunday evening. The ticket is compulsory for camper vans and tents with vehicles. Please note that no additional parking ticket is necessary. Don&apos;t forget...to have a great day at the circuit, we recommend that you wear sunglasses, sun lotion, a cap and comfortable footwear. The circuit is located 35 km North of Barcelona, by car there are various routes, the two most popular being C-17 or AP-7. By rail the station is Renfe Montmelo. It is a 30 minute walk to the circuit. 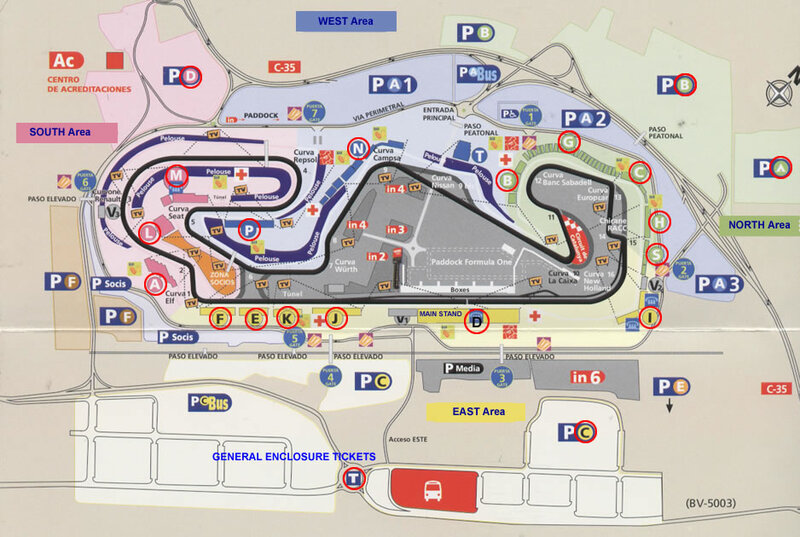 By bus it is a 10 minute walk to Grandstand J. Barcelona International Aiport is located 13 km South West of the city, approx 50 km from the circuit. E02 - 343.00; E05 - 443.00; E06 - 333.00; E07 - 443.00; E08 - 243.00; E09 - 343.00; E10 - 343.00; E11 - 243.00; E12 - 243.00; E13 - 343.00; E17 - 243.00; E18 - 21.00; E19 - 21.00; E20 - 23.00; E21 - 48.00; E23 - 21.00; E30 - 143.00; E31 - 58.00; E32 - 98.00; E33 - 58.00; EA01 - 143.00; EA03 - 102.00.